The DBAL-I2 dual beam aiming laser is equipped with a Class IIIa visible red laser pointer and a Class I infrared laser pointer. 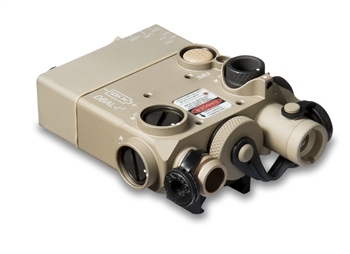 Built to perform under the most rigorous conditions and survive the harshest environments, the DBAL-I2 allows users to seamlessly transition from day light maneuvers to low light operations with ease. The DBAL-I2 dual beam aiming laser can fit most rifles, carbines, or submachine guns equipped with NATO 1913 or Picatinny rails. *Note The DBAL-I2 is classified as an ITAR regulated product and is prohibited from being exported outside the United States without a valid export license issued by the U.S. Department of State.